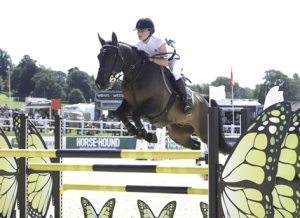 Top showing producer Allister Hood claimed his seventh British Horse Society Supreme Ridden Horse Championship title today at the Longines Royal International Horse Show. 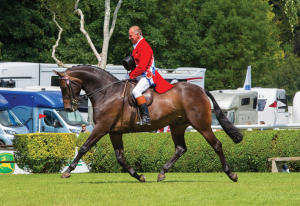 The Norfolk-based showman has won the Winston Churchill Cup – given to the overall supreme champion show horse at Hickstead – more times than anyone else. Today he came double handed to the championship, having qualified for the final with the Saracen Horse Feeds Supreme Riding Horse Champion Diamonds Are Forever and the Surrey Envelopes Supreme Cob victor Our Cashel Blue. His elegant show on the dark-bay eight-year-old riding horse champion set the standard early on. The performance netted a score of 28 out of 30 from the three judges, including a perfect 10 from Tom O’Brien from the Al Shira’aa stables. Allister’s dream day was then made complete when cob Our Cashel Blue was crowned reserve Supreme on a score of 26. “The first time I won the Supreme was with my hack Brown Buzzard back in about 1981,” said Allister, who has since gone on to win the title a further six times. “Diamonds Are Forever is a real show horse with great charisma and movement. He gives you the most incredible feeling when you ride him. He’s been unbeaten for two seasons now,” he added. It was a real family affair in the Supreme, as Allister’s son Oliver also came forward with the Ridden Skewbald & Piebald champion Kellythorpes Master Key – they were one of three Supreme finalists who tied on a score of 22. The British Pony Team riding under the title sponsor banner of Team LeMieux did Great Britain proud when they won Team Silver earlier this evening at the FEI Pony European Championships in Kaposvar, Hungary. All British riders had put in a solid performance during the first round yesterday and their performances today further highlighted the depth of talent we have within the Pony environment. Allana Clutterbuck aged 16 from Upminster, Essex with Sultan Du Bary an 11-year-old bay gelding owned by Susan Evans came forward to the first round today with a clear penalty score so it was unfortunate to see them pick up 4 penalties mid course in the first round. With all to play for in the second round and knowing that a medal was at stake, Allana absolutely pulled it out the bag when she broke the finish line clear and within the time allowed to secure Great Britain a Silver medal podium position. Ireland took Gold finishing just one jump ahead of Great Britain with their 4 penalties whilst the Netherlands, who sat two-time penalties behind us were relegated into Bronze. Allana Clutterbuck, aged 16, from Upminster, Essex with Sultan Du Mary has been selected to represent Great Britain under the title sponsor banner of Team LeMieux in the Pony European Championship in Kaposvar, Hungary. The competition takes place between the 25th – 30th July 2017 at the Lovasakademia Sport Club. The Pony Team medals will be decided on Friday 28th July at 15:00 hours local time whilst the Pony Individual medals will be decided on Sunday 30th July at 15.00 hours local time. The Chef d’Equipe accompanying the team will be Clare Whitaker. Last few spaces left for Redwings Horse Sanctuary’s FREE CPD course for farriers. The CPD course runs on 30th August – at Redwings Ada Cole near Harlow, Essex, EN9 2DH. Update your knowledge on equine welfare and build on your client communication skills to the benefit of your business and the horse! DON’T MISS REDWINGS’ OPEN DAY NEXT SUNDAY 23RD JULY! The UK’s largest horse sanctuary is opening the doors to its Norfolk headquarters this July for an exclusive look behind the scenes. Join Redwings Horse Sanctuary’s team and residents on Sunday 23rd July 2017 for a day of tours, demonstrations, food and fun at their Hapton headquarters, south of Norwich. Although the Sanctuary has visitor centres across the UK, it is only on special occasions that Redwings opens its headquarters to the public, so there is a great deal of anticipation for the return of the Redwings Hapton Open Day this summer – and with a jam-packed schedule of activities in store, the event definitely will not disappoint! A fun day for all the family, the event will include tours of the charity’s Horse Hospital by its veterinary team where visitors can meet rescued horses and donkeys, and find out about how the charity cares for its 1,500 residents – of which almost 350 live at their 350-acre headquarters. Redwings’ rehoming team will be showcasing how the charity trains its horses – many of whom have been rescued as completely unhandled or semi-feral – to get them ready to find loving homes outside the Sanctuary. And special guests Norfolk Fire and Rescue will be there on the day to offer a fascinating demonstration of how they rescue animals from tricky situations – with the help of training model horse Randy of course! There will also be lots of opportunities for visitors to get hands-on with the horses themselves with “Meet the ponies” tours, pony grooming and even a chance to meet Redwings’ mascots Red and Wings. But that’s not all, Adoption Star Maya will also be paying supporters a visit at the open day. Visitors can enjoy meeting the charity’s very own real-life Black Beauty, who just like the beloved fictional character, sadly had to overcome adversity before her rescue and becoming the stunning and friendly girl she is today. After all that fun, visitors can take their pick from a range of hot and cold food and drink options, as well as peruse the charity’s bring and buy sale offerings or shop Redwings’ exclusive gift range, which will be available at special discounted rates for the day. “We are delighted to be able to once again open the doors of our headquarters to visitors,” commented Redwings Chief Executive Lynn Cutress. 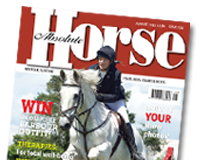 “As we are a charity funded 100% by donations, it is so important for us to be able to offer our supporters these unique opportunities to see behind the scenes and exactly how their generosity helps us to help horses in need. Everyone really will be welcomed with open arms and we are hopeful for a fantastic turn out”. Entrance to the Redwings Hapton Open Day is completely free and every visitor will receive a free tea or coffee voucher to be redeemed at any of the charity’s five UK visitor centres, which are open all year round. The Redwings Open Day will take place on Sunday 23rd July 2017 from 10am to 4pm at Redwings Hapton, Norwich, Norfolk, NR15 1SP. The following squad has been selected to represent Great Britain under the title sponsor banner of Team LeMieux in the Pony European Championship in Kaposvar, Hungary. The competition takes place between the 25th – 30th July 2017 at the Lovasakademia Sport Club. Faye Sutton, aged 15, from Whitchurch, Shropshire with Robe Ruadh, a 13-year-old dun gelding owned by Jacqueline Sutton. 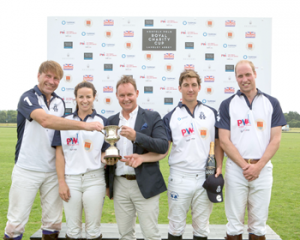 £90,000 for the charities, of which the Duke of Cambridge is Patron. established Norfolk equine health company, provided sponsorship of the opposing team. professional George Meyrick and Paul Bussey, whose famous Norfolk family firm also supported the day. Dundas and the Townsend brothers, Tom and Charlie, both teenagers and both Young England players. the ball in to start the match from a wonderfully apt vintage Bentley motor car. breath taking aerobatic display finale. NEW farrier CPD to provide practical training on equine welfare, the role of welfare organisations and client communication skills. Redwings Horse Sanctuary has launched a new CPD course with support from the BFBA and Dean Bland from Well Equine Ltd. 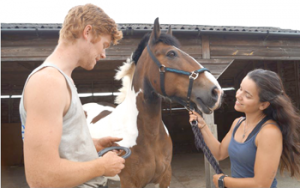 The course aims to help farriers improve their knowledge of equine welfare and build on existing skills in client communication to improve horse owner understanding of farriery and foot care. Forging Welfare Partnerships aims to have a real benefit on the working lives of farriers and the welfare of horses. The CPD course runs over two days – 26th July and 30th August – at Redwings Ada Cole Visitor Centre near Harlow, Essex, EN9 2DH. To sign up for your free place call Andie on 01508 481066/07711489622 or email avilela@redwings.co.uk. Animal rescuers round-up TEN horses running loose on housing estate! Animal rescuers and police officers turned cowboy for the day after being called to round-up a herd of ponies running loose in Peterborough recently. 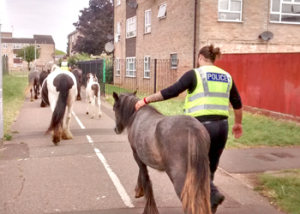 The RSPCA were called on Saturday morning (1st July) to reports of 10 ponies roaming around a housing estate in Peterborough. RSPCA inspector Justin Stubbs, officers from Cambridgeshire Police and volunteers from Fenland Animal Rescue attended Scalford Drive and worked together to herd the horses back to the safety of their field. “We believe someone opened the gate and released the horses during the night,” Inspector Stubbs explained. “To do something so foolish, probably as a joke, is extremely careless and irresponsible. These horses could have easily strayed onto a busy road and been hurt or killed if involved in an accident. This also put the lives of drivers at risk. “Unfortunately we weren’t able to contact the owner but, luckily, between all of us, we were able to round them up and walk the ponies the half a mile journey through the housing estate and back to their field! The ponies – mostly small cob-types – were all in fairly good condition and were returned to their field nearby. “This incident could have been much more serious had the herd made their way onto any main roads or into the paths of traffic,” Inspector Stubbs added. “Thankfully, all went well, and I’d like to say a huge thank you to everyone who helped to ensure that all the horses were safe and sound. If you see a horse or farm animal on a public highway, please report this to your local police force by calling 101. Anyone who is concerned for the welfare of an animal can contact the RSPCA’s 24-hour emergency hotline by calling 0300 1234 999.